All of you that follow me here, by now know that I am in continuous research of something new when it comes to crocheted dolls. I love dolls and for the few weeks have been inspired with cloth dolls, specially the Holly Hobbie and Raggedy dolls. That is why I tried to make a doll in one piece with flat head; one you would get if sewing the doll. Have to say that it really was a challenge. By now I have finished the little one. She is 15 cm / 5,5″ tall. Have the pattern and we can start working and making many, many different kind of dolls from this one. 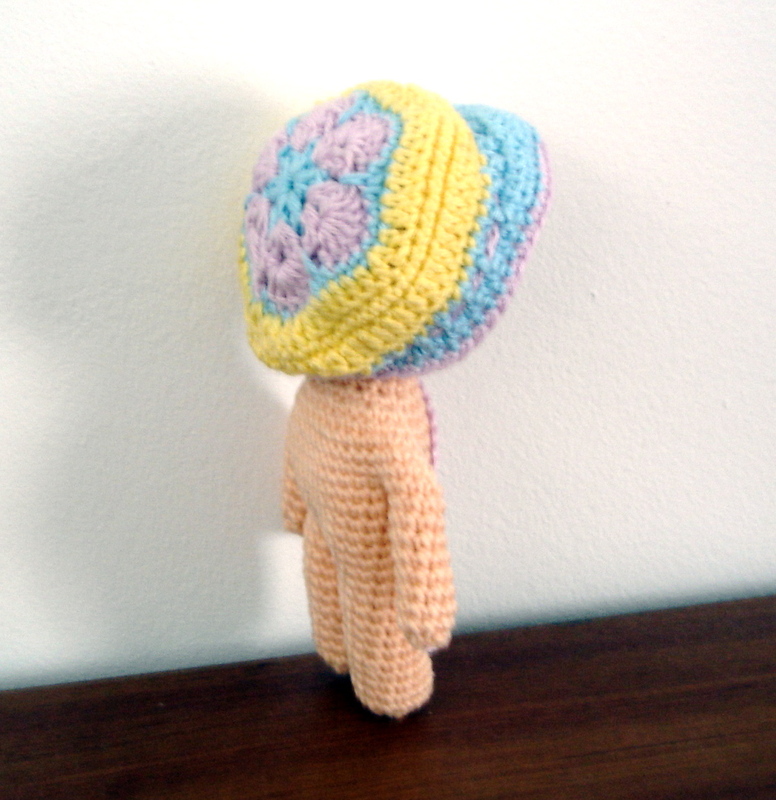 As I said, this doll and the pattern is done for the flat looking head. If you prefer round head, as most of the ami dolls have, start with sc6 in magic ring and continue increasing each row until you reach 48 stitches. at this point repeat 48 stitches for 5-6 rows, then start decreasing until you reach 18 stitches, from where you can continue following this pattern to finish the body, arms and legs in one piece. 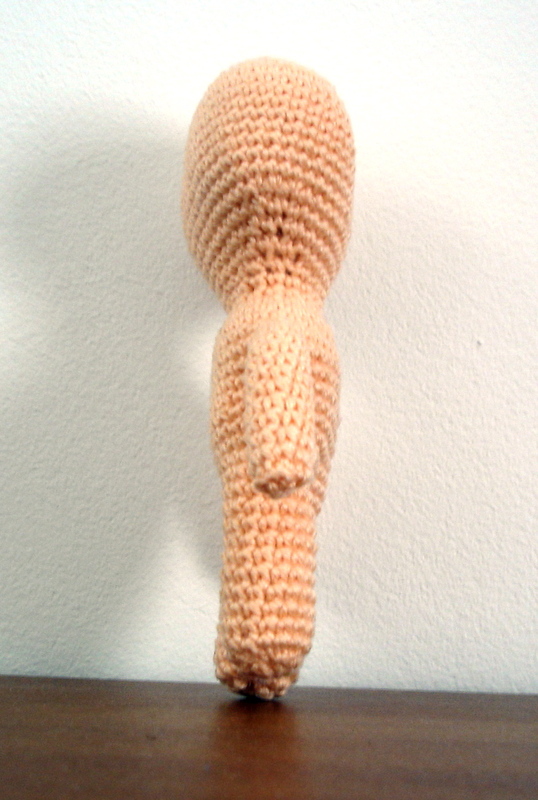 For this doll I used 2 mm crochet hook. Tapestry needle for closing the row ends and gaps between the limbs. All doll is worked in continuous rounds. Begin stuffing the head at this point. Stuf the head some more if needed, and continue stuffing the doll as we go. We are starting to make arms here. R1 sc5, sl st to 5th stitch from the end, ch1, sc5 (10 sts) -to make it easier …. Mark the first stitch at this row. From this stitch, going backwards, count 5 stitches and mark that stitch too. This will be the 6th stitch you will single crochet and continue till you make 10sc for one arm round. Tie off leaving long end. Stuff the arm from the inner side. Thread the needle and wave the thread through the outer stitches (5 of them) now pull gently, stuck the needle from the center of this circle made and pull it through the arm to close the gap and hide the access thread. Tie off leaving long end for sewing later. Stuff the arm and close the last row as described for the first arm made. Now comes the rest of the body part. At this point we are starting to make legs. Stuff the body so we can continue. Now look at the last row. Mark the middle, count (equally) 14 stitches on each side. Tie off leaving long end for sewing. Stuff the leg. Close the last row as described under arm session. You might want to leave the thread available for sewing the gap between the legs (and arms if the gap under arm is visible). Tie off and repeat as with first leg. Sew the gap between the legs and under arms if visible. You have just finished making doll in one piece! Now dress her, sew on the hair, paint or design her face and let your daughter or granddaughter enjoy! Like I said, there will be many patterns for this doll available. Here is another photo of the doll with just the hat on. Hope you have enjoyed. If you ask me, this “one pice doll” is great for kids to play with and is really, really easy to do in any size you like. Looking forward to hear all of your comments and suggestions. Even ideas on what to do are welcome! Thank you for your time spent with me here! for this size of doll what size (in mm’s please) of eyes would you use. I use plastic safety eyes. I would go with 5 or 6 mm. I like smaller eyes on my dolls. You should really try and see what you like better. Try to place on different sizes and see which ones match your dolls the best, or which ones you like the most. I am working on a sheep and the limbs are killing me! is there a way to make them faster? Unfortunately, for such kind of dolls, one piece, this is the only way. 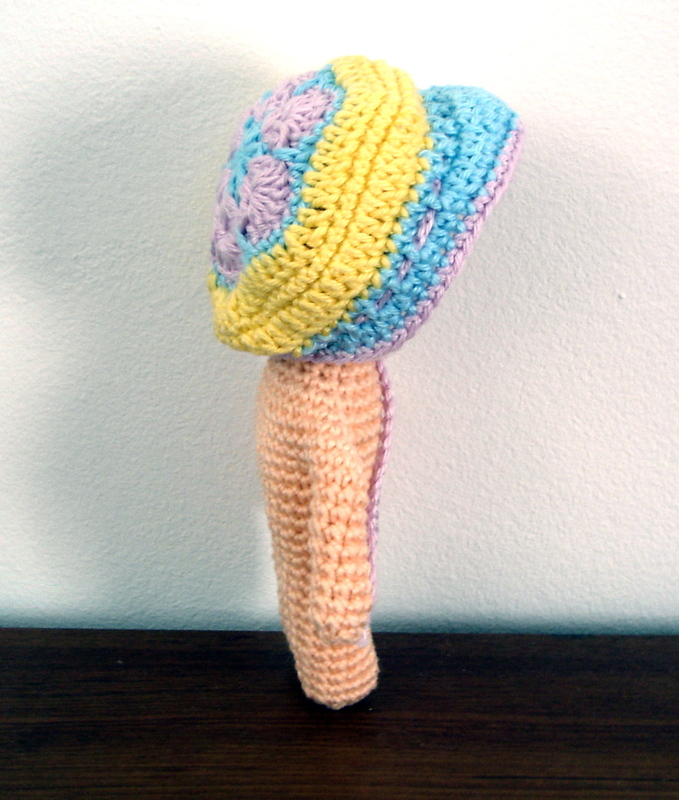 And yes it is not easy to crochet the limbs this way, but is worth little trouble. I want to make this doll!! However, after reading the pattern. I do not understand how to do the arms. This will be my first doll. For the first doll you might want to try something easier. What I can do regarding this one is to make little photo tutorial to make it easier for your try. But with all the work have to delay this for January next year. If you have time to wait till then I will be glad to help you make this doll. 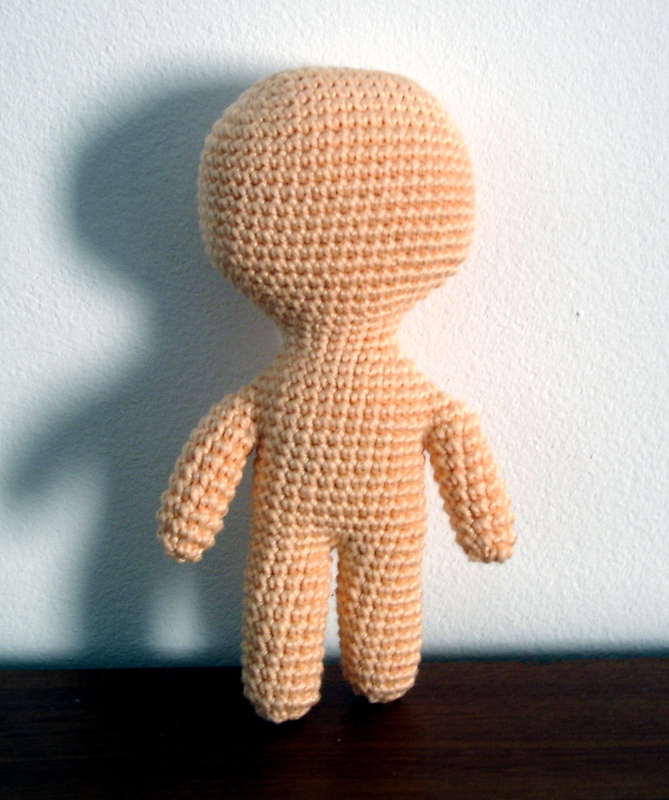 Meantime, take my advice and try some other small doll projects to get familiar on how dolls are made.